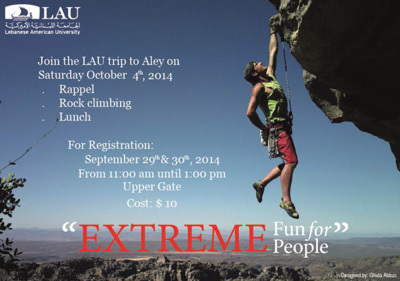 The Dean of Students Office in Beirut is organizing a trip to Aley on Saturday October 4, where you will have the chance to rappel and rock climb. Lunch will also be served. To register stop by the stand at the upper gate between 11 a.m. and 1 p.m from September 29-30. This trip will cost $10, which includes the lunch and activities.